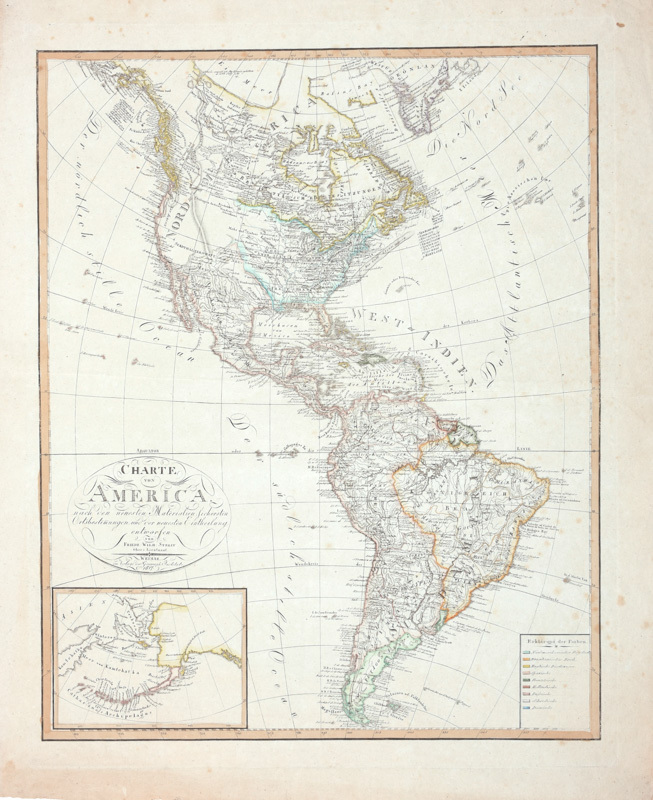 Note: This is a very detailed and precisely engraved German map of the Americas. Colored key at bottom right identifies nine colonial powers on the hemisphere. An inset of Alaska at bottom left features place names along the coast and includes the entire Aleutian Chain. The United States is depicted with its new acquisition of Louisiana Territory. The boundaries in the west, between both Canada and Mexico, are not delineated, and the unexplored regions are left blank. The future Northwest Territories is labeled Indiana. The South American continent is very well mapped and filled with detail. Fancy script lettering with flourishes in cartouche.